Prayagraj (Kumbhanagari) : Political party which wants to come to power in forthcoming Parliamentary elections, should fulfill Hindus’ just demands, stated Shri. Kapil Mishra of ‘Hindu Charter’ and MLA (independent), elected from New Delhi. He was speaking in press conference held at Sanatan Sanstha’s exhibition at Kumbhanagari on the subject of ‘Hindus’ Charter’. Sadguru (Dr.) Charudatta Pingale and Sanatan Sanstha’s spokesperson, Shri. Chetan Rajhans were present on the occasion. 1. ‘Hindu Charter’ is the manifesto of Hindus. ‘Charter’ has been prepared based on the demands of Hindus in India. Here, the Government claims to be secular on one hand; while minorities are given reservation based on religion when it comes to passing of Common Civil Code. Providing scholarships, education, jobs, setting up special commissions, special reservation to minorities based on religion, are a kind of breach of Constitution. The Constitution of this country is drafted to discriminate Hindus and Hindus are treated like secondary citizens. Hindus need to unite and pressurize political parties for bringing change in this situation. 2. The personal Bill presented by Shri. Satyapal Singh in the year 2016, should be passed. There are various demands made in this Bill such as management of temples should be handed over to temple and religious institutions; Hindus should get equal right in all Government schemes, scholarships etc; ancient Hindu scriptures should be included in educational curricula; government’s interference in Hindu organizations through investigating machinery should be stopped; seed capital of Rs. 10000 crores should be provided for preservation of Hindu literature, Art, dance, culture etc. 3. All political parties feel that they are following Constitution by working for minorities, which is basically wrong. 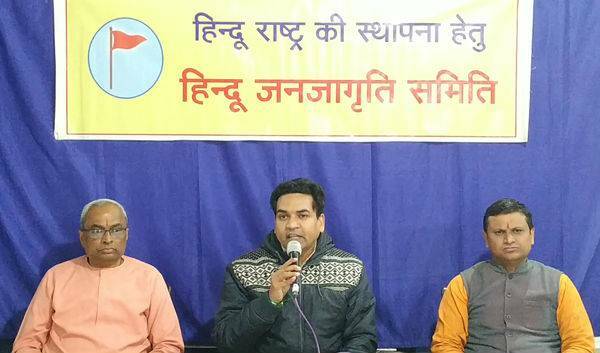 ‘Hindu Charter’, Sanatan Sanstha and HJS are working together, to create awareness amongst Hindus. All political parties will be pressurized once Hindus are awakened. Then, they will realize that decisions taken by them are wrong. Our own Constitution and laws are being used against us, which should be stopped. 4. Sacchar Commission was set up which was ultra-vires of the Constitution. Politics of vote-banks is played in this country by appeasing minorities. Government takes over temples for management; but churches and mosques are kept out of Government’s control. 5. Hindus are treated as secondary citizens and minorities are like primary citizens. All citizens must get equal treatment; word ‘minority’ should be replaced with the word ‘citizen’ wherever it appears in Constitution; funds received from other countries are used for conversions; therefore, it should be banned; after some period, India will hold the first position in export of beef; therefore, ban should be immediately imposed on its export, are the demands of ‘Hindu Charter’. 1. Hindus will not get their due rights till all political parties do not support Common Civil Code and it is implemented. Nobody can ignore Hindus’ Sentiments, who form 80% population. Rahul Gandhi’s going to temples; Mamta Banerjee’s sponsoring ‘Durga-puja’; communist Government of Kerala celebrating ‘Ramayana maas’ is the effect of awareness created amongst Hindus. We are warning all political parties that they should know Hindus’ feelings and fulfill expectations of Hindus as awareness is created in them now; else political parties which don’t fulfill Hindus’ expectations, will have to pay its price. Hindus will extend support to only those parties which agree with Hindus’ demands. 2. If the Government believes in ‘Sarva Dharma Sama bhaava’, why does it grant permission for conversions? Act banning conversions should be passed. 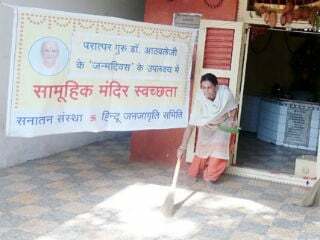 The Government has prohibited Hindus from imparting ‘Dharmashikshan’; temples are taken over by government; but managements of churches and mosques are not taken over. Thus, there is atmosphere of inequality and discrimination in this country. 3. The Government is sending back Kashmiri Hindus without providing any security by offering bait of Rs. 40 lakhs which means Hindus are sent to die for a price. The Government should provide full protection to Hindus before sending there.